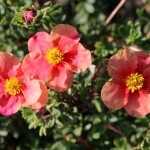 A small, compact shrub with peach colored flowers that have a dark peach-red eye. As the flowers age, they can pale, creating many tones of peach, pink, and yellow in a setting sun effect. The flowers appear late spring through fall. The foliage is a dense gray-green. Adapts to poor, dry soils. Prune as needed to maintain a tidy form. PP 20,299.